There are the eight elements that we consider are essential for governance to be effective. Although the elements are important in their own right, those involved in public administration need to consider how they apply to the particular context of the organisation or project that they are involved in. This applies to members of governing bodies and also to chief executives and senior managers who report to, and work with, governing bodies. The elements apply to organisational (or corporate) governance and programme or project governance. Governors' strategic thinking and planning to prepare a coherent strategy is fundamental to effective governance. It is one of their most important roles. Governors need to contribute to, and challenge, the strategic planning process, based on an understanding of stakeholder expectations and the wider context that their organisations operate in. Strategic direction-setting includes setting realistic medium- and long-term outcomes and short-term priorities, and expenditure/investment choices and budgets. Clarity of purpose is also important at the specific project and programme of work levels. The roles and responsibilities of each party, including governing board members, shareholders, management, staff, and other parties (such as stakeholders) must be clearly defined. Clear roles and responsibilities make the differing interests transparent and foster effective decision-making. A governance charter, or governance statement, can be a useful way to outline the structures, principles, and processes to be followed. However, the art of effective governance is in the execution of what is set out in the charter. The leadership role of governors is to set a suitable tone from the top that shapes the culture and demonstrates the desired values and ethics of the organisation. This is achieved through establishing and approving policies, making decisions, and the approach and behaviour the board takes to its work, both with management and external stakeholders. For governance to be effective, it is critical that the right people are involved. The level of trust between people – between governors, management, and stakeholders – affects the effectiveness of the governance arrangements. Having the right mix of people and skills on a governing body should help it to be more effective. An effective board will have members who bring multiple perspectives, who debate issues robustly, and who then speak with unity of voice and message about the decisions made. Strong relationships between governors and stakeholders are important. Effective stakeholder engagement is of particular value in understanding stakeholder views when making important decisions, forming strategies, and identifying sources of funding. Good practice involves preparing formal stakeholder engagement plans or formal relationship protocols with important stakeholders. Governance practices need to support accountability. Governance structures should include a clear accountability framework that shapes how an organisation's (or project's) financial and operational performance will be monitored and reported. The framework should also cover how the governing body will be accountable for future-focused decisions, such as maintaining and enhancing the capability of the organisation. 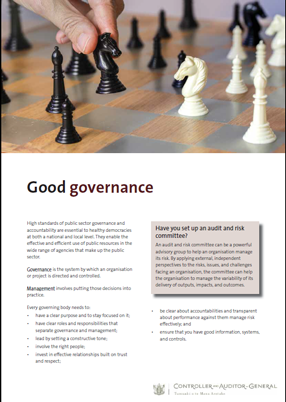 Effective governance depends on governing bodies receiving regular reports that provide a clear and objective view of an organisation's (or project's) performance. Governing bodies need to be provided with enough detail to support performance management and decision-making, while avoiding unnecessary details about operational matters. Governing bodies have a leading role in establishing an organisation's overall understanding of risk, including the potential effect of its strategic, financial, operational, and reputational risks. Effective risk management by public organisations involves identifying, analysing, mitigating, monitoring, and communicating risks. We expect to see a risk management framework and register that is formally defined, widely understood, and aligned to the organisation‘s strategy, risk appetite, objectives, business plan, and stakeholder expectations. Governors are accountable for the decisions they take. Therefore, they need relevant, accurate, and up-to-date information to make good decisions. Governing bodies also have a role in assessing the design and effectiveness of an organisation's internal systems and controls. These systems and controls are organisational (terms of reference, independence, and separation of duties), operational (planning and budgeting) and about personnel (recruitment, training, and development). These systems and controls are critical to providing assurance that an organisation's activities are compliant and in line with expectations. The governing body has a role to review them regularly to ensure that they remain fit for purpose.